I’m so excited to bring you this caramel cashew crunch recipe! It is the perfect mix of salty and sweet!! It’s that time of year where there is always some party, bake sale, Christmas gift, movie night…always something that you need a treat for. Well look no further because this is your treat! It’s delicious. It’s freezable. And it’s easy. Rejoice! 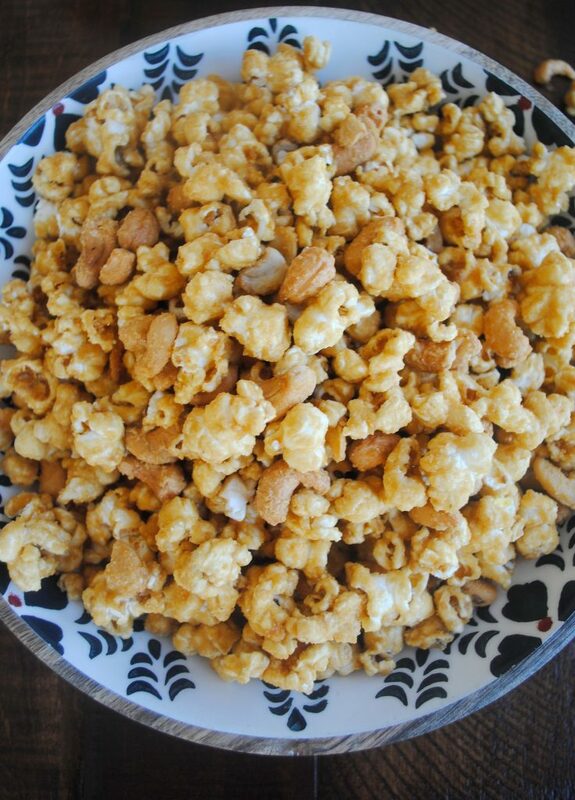 I was actually making my original caramel corn recipe when I came up with the idea for this amazing treat! I’m a snacker. You hear of those people who forget to eat? Yeah, I am not one of those people. I remember. I forget why I entered a room, yes. I forget the appointment to get my teeth cleaned, yes. But I do not forget to eat. So in an attempt not to snack on the tasty caramel corn as I stirred the gooey, caramel goodness, I thought a healthy snack would keep me from indulging. The intent was there. 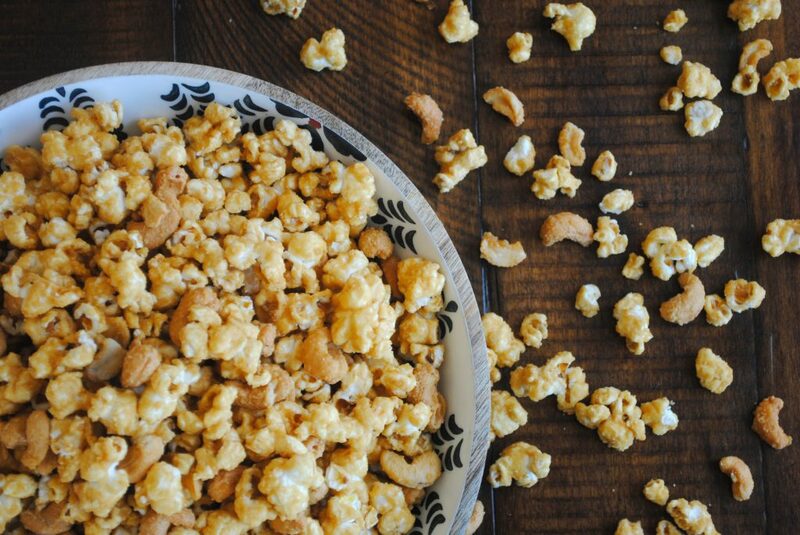 But then I snacked on my cashews, I couldn’t stop thinking about what a tasty addition they would make to my original caramel corn recipe. And so, with just a few tweaks, cashew crunch was born! I love that this treat can be placed in a bowl and munched on at a party for the masses or easily divided up into single servings as an individual treat. Another amazing thing about this recipe: it’s freezable! If you haven’t guessed it by now, I love a freezer recipe. It allows you to make food on your own time, and then pull it out anytime. If you have the freezer space, I highly suggest doubling or tripling the batch so that you can have a ready made treat all season long. During the holiday season there are so many people to thank and give gifts, too. 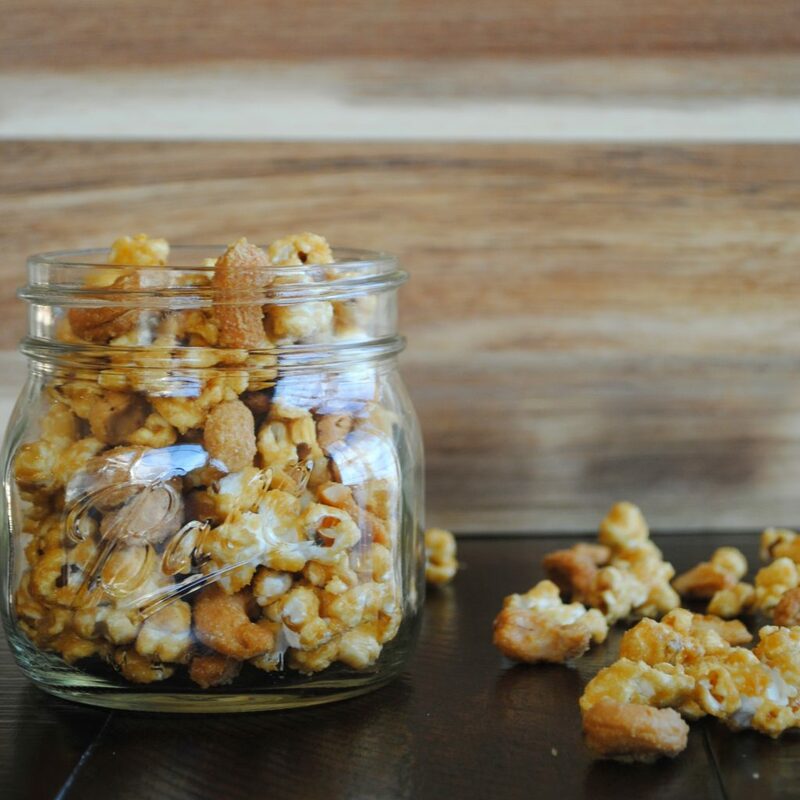 This cashew crunch as well as the original caramel corn make perfect teacher, hostess, delivery person, or Sunday school teacher thank you gift any time of year. Place it in a mason jar, personalized mug, or cute Christmas bag or container as a thoughtful, homemade gift. The recipe is simple. First, preheat oven to 250. Pop and salt popcorn. Bring butter, brown sugar, Karo Syrup, cream of tarter, and baking soda to a boil on the stove stirring frequently. 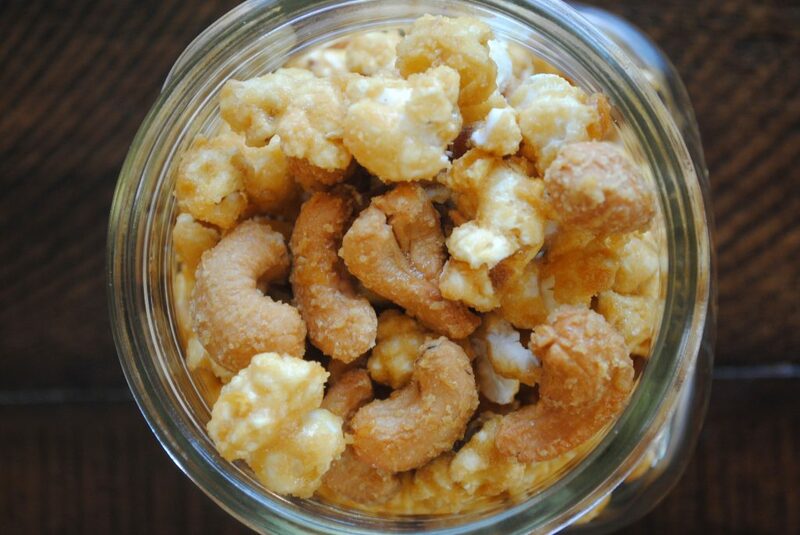 Combine Cashews and popcorn in an oven safe baking dish. Next pour mixture over popcorn. Stir to evenly distribute caramel over the popcorn. Bake for 1 1/2 hours stirring every 15 minutes. Combine Popcorn and Cashews in baking dish. Bring butter, brown sugar, Karo Syrup, baking soda, and cream of tarter to a boil stirring frequently. Stir to evenly distribute mixture over all the popcorn. Bake for 1 1/2 hours stirring every 15 minutes. Store in air tight container or individual treat bags. To freeze, place in air tight container. And simply pull out when ready. Looking for more seasonal recipes? Looking for more freezer meals? Five minute salsa, Banana pepper salsa, or Peach Caprese Salad. 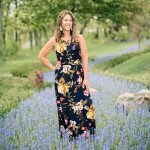 Mama In The Midst Contains Affiliate Links. Thank you for clicking around my sight! « The Best Small Shops to Shop for This Christmas!